Is anybody else interested in stained glass on stamps? Kannik, I don't have any stamps depicting stained glass images but would like to see what you have collected. 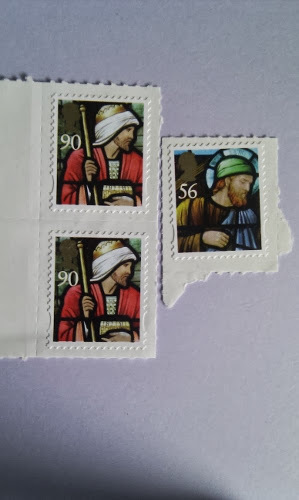 The 2009 Christmas stamp issue from Royal Mail was Stained Glass Madonna & Child, and are self-adhesive, I may even have a couple left. Sorry - Ive been missing some posts recently, but got some today and was searching around, too! I will put some of my stained glass up really soon! or type. That will come when I arrange them formally! Kacyds, MikeC99 and Fairyfoot - I put up 4 images of Stained Glass on stamps here about 3 weeks ago, but nobody seems to have seen them yet! With my visit just now, there have been 94 views of this thread. If you deduct the five previous times I clicked on, there have been 88 visits. When I get some free time I will look up some stamps I may have depicting stained glass. Kannik, thanks for posting the stained glass stamps. I thought I didn't have any but now realize that I do have a few Christmas images. I'll see if I can find them. This Great Britain stained glass stamp is Scott # 662 issued on Oct. 13, 1971. It depicts the Adoration of the Kings. This Great Britain stained glass stamp is Scott # 663 issued on Oct. 13, 1971. It depicts the Journey of the Kings. This Canadian stained glass stamp is Scott # 1669 issued on Nov. 3, 1997. It depicts Our Lady of the Rosary. This Canadian stained glass stamp is Scott # 1670 issued on Nov. 3, 1997. It depicts the Nativity Scene. This Canadian stained glass stamp is Scott # 1671 issued on Nov. 3, 1997. Stained glass is so beautiful, especially on stamps. Thanks for sharing these.